Protect yourself and those on your premises by displaying Hazardous Area Signs in appropriate locations to warn of potential risks. Ensuring that people are aware of the hazards they are exposed to means that they can protect themselves by taking the necessary safety precautions. Hazardous areas in the workplace may include exposure to potentially explosive elements, harmful gases, acidic chemicals or electrical equipment. 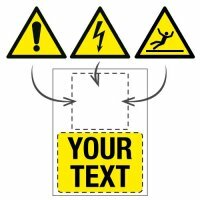 All our hazard signs listed below comply with current BS EN ISO 1710 guidelines and are available in a wide range of sizes, messages and materials – see our guide to sign materials for more information. Safety Zoning Floor Marking Kits - Hazardous No Admit. Safety Zoning Wall Marking Kits - Hazardous No Admit. Hazard warning signs cover a whole host of different areas of risk – determined by what substance or activity can be found on site. They’re required by law and help keep employees, staff and members of the public safe by indicating the presence of danger or hazardous materials. They help us pre-empt danger and identify the levels of risk we’re exposing ourselves to so that the necessary precautions can be taken to stay safe. Hazardous areas are zones, within your premises, that have been isolated and identified as a risk to an individual’s safety. These locations may have also been graded with a hazardous area classification – common examples being toxic compounds, dangerous chemicals, noxious gases or explosives. In these instances the relevant signage should be use; for example, chemical warning signs. These areas could also be zones that expose employees to high levels of sound, such as the frequencies emitted by warehouse machinery or which perhaps pose a risk of trips, slips or falls. Regardless of what the hazard may be, current Health and Safety Regulations require premises owners to clearly signpost them to others. There are two main systems used to classify hazardous areas: the Class/Division System and the Zone System. In the first system, Class I refers to gases, Class II covers dust and Class III is for fibres such as asbestos. Each Class is then broken down into two further Divisions, regarding the level of risk in their location. The Zone System looks at the risk of explosions in risk areas. When electrical equipment is stored and used in or close to a hazardous area (which may contain flammable gases, liquids, fibres or dust), there is a very real threat that a fire or explosion may occur. These areas are marked as a hazardous (or classified) location. 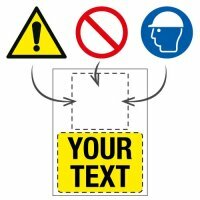 If wall space is limited and you have more than one message to get across, then our Hazardous Storage Area Guidance Safety Signs are ideal. They include both a hazard warning plus information on each of the GHS symbols. No matter which Hazardous Area Signs you choose to safeguard your staff or other members of the public, as industry leaders within the Health and Safety field, we’ll have the message, material and size of signage to suit your needs. However, in the unlikely event that we don’t, we also offer a second-to-none online sign customisation service. Our range of sign fixings can also help you securely display your new signage – whether this is indoors or outdoors, and regardless of the surface you choose to affix it to. If the sign is to be affixed to, for example, a damp or uneven surface then a permanent adhesive should be considered. Our SignFix Permanent Adhesive is ideal for fixing rigid plastic signs both indoors and out.